Oh for the Love of…Dress Clips! | Oh, for the Love of Vintage! Just as the title suggests, this post is about my love for vintage dress clips. I love that I can add a set of clips to a favourite dress and easily alter the look of the ensemble. Jewellery isn’t just meant for your ears, neck, wrists or hair. Your vintage dress calls out for adornment also. I can’t help it that I like sparkly, shiny things! 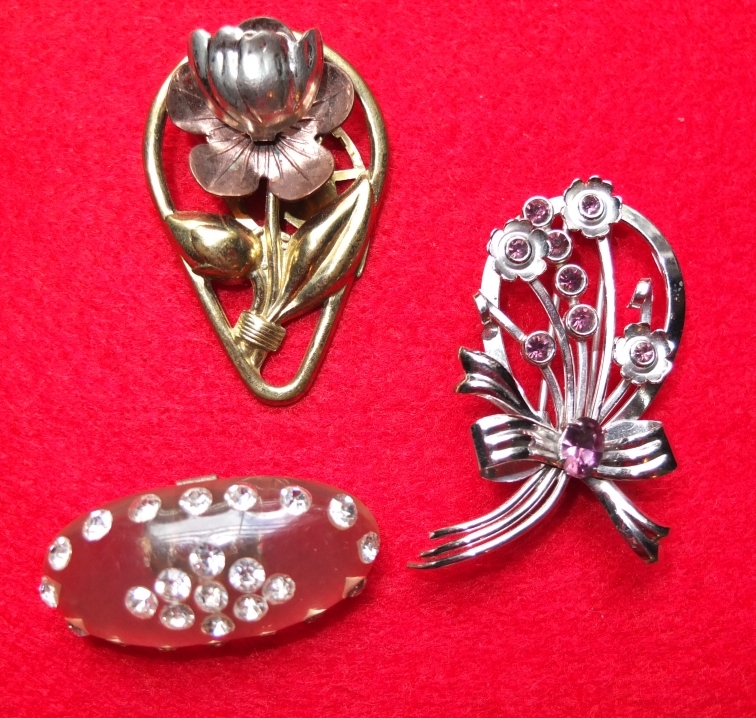 Dress clips were made from the 1920s to early 50s and came in a variety of styles, colours and settings. These clips became particularly popular in the 1930s. I’m unsure how far dress clips date back prior to the 20s, but perhaps they were around. If you know when they first started being manufactured and/or have examples, please do tell me. 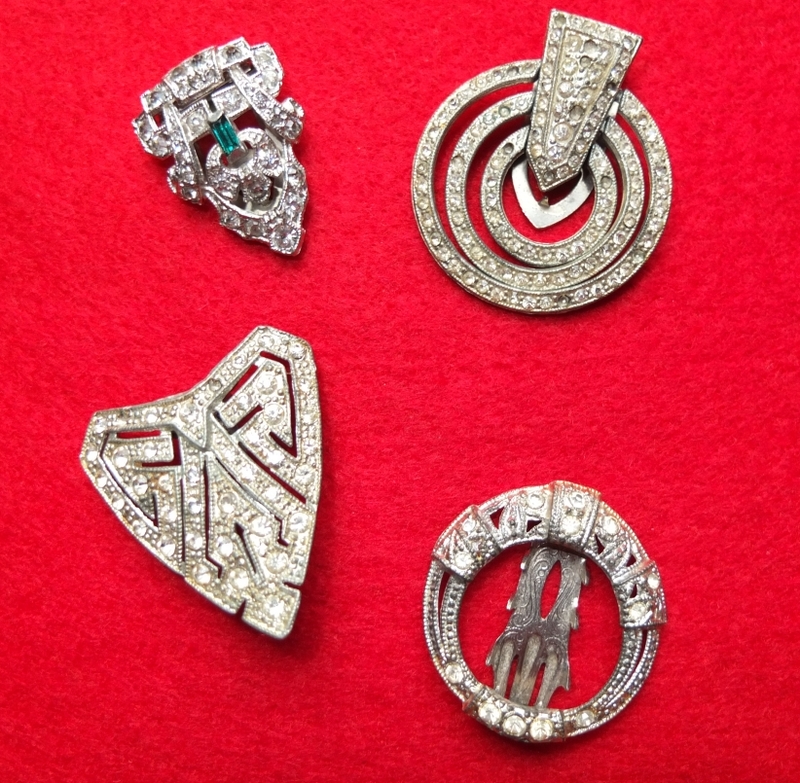 Dress clips were worn to accentuate the neckline, lapel or back of a dress. I particularly love how dress clips look on a vintage dress that has a sweetheart neckline. Also, the square neck cut of a 30s frock looks just fabulous with a dress clip at each side. Most jewellery manufacturers, whether costume or fine jewellery, had their dress clip line. One just has to pick up a vintage costume jewellery book to see lovely examples of dress clips made my Trifari, Coro, Napier, Eisenberg, Miriam Haskell, Sherman, etc. 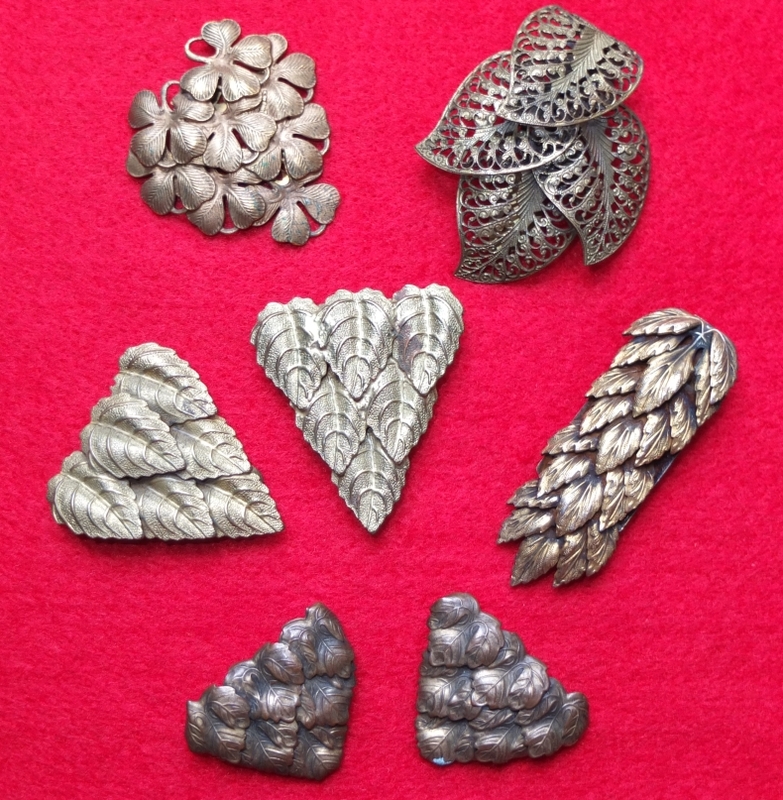 Dress clips were made in a variety of types, styles and materials. 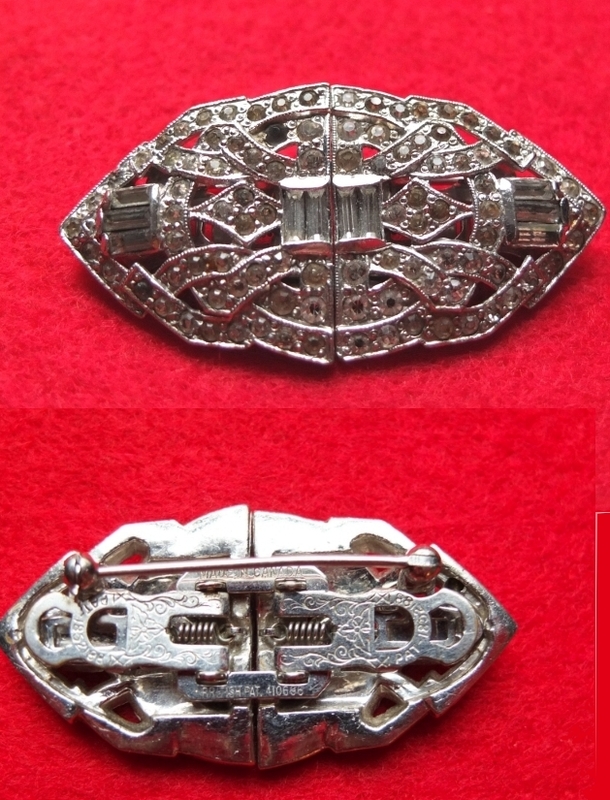 Silver, rhinestones, diamonds, crystals, enamel, wood, Bakelite and various metals were used to craft gorgeous dress clips. Some were made as two separate clips, others sold together as one larger clip (or pin) that you could separate and wear as two clips. I love both varieties and am lucky to have examples of both in my jewellery collection (thank you Mom). 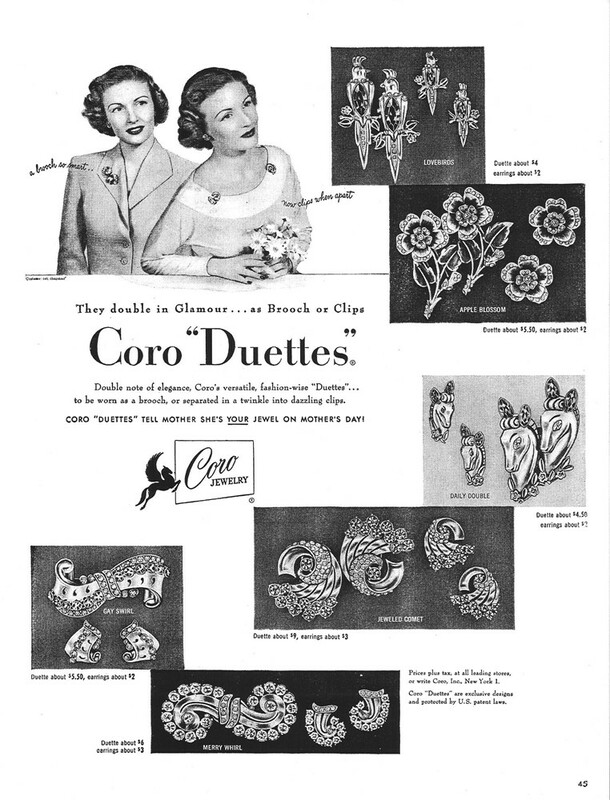 In 1931, Coro patented the “Duette” and its locking mechanism. Some sources claim that designer Adolph Katz patented the Duette, where other sources state it was Gaston Candas. For the sake of this post it doesn’t matter, but it’s an interesting question as to who was the originator. The Coro Duette was a set of dress clips that locked together and could be worn as one large piece or two smaller dress clips. It was only five years later in 1936, that Trifari created their version of the Duette, called the Clip-mate. Duettes and Clip-mates look similar to me, but can be distinguished by their locking mechanism. I could try to explain the difference, but I’d only struggle at the description. Do check out TruFaux Jewels for the utility patents on both Coro and Trifari’s dress clips. It’s easier to notice the difference in the locking mechanism by looking at these illustrations. I have only one dress clip that is locked together like the Duette and Clip-mate. I’m unsure who manufactured it, as the markings only indicate that it was made in Canada and is British patented. Let’s have a look at my beauty! This is another of my favourite dress clips, a sweet 1940s cherry clip. Sadly, it has seen better days and is chipping a bit. Still, I love it so! 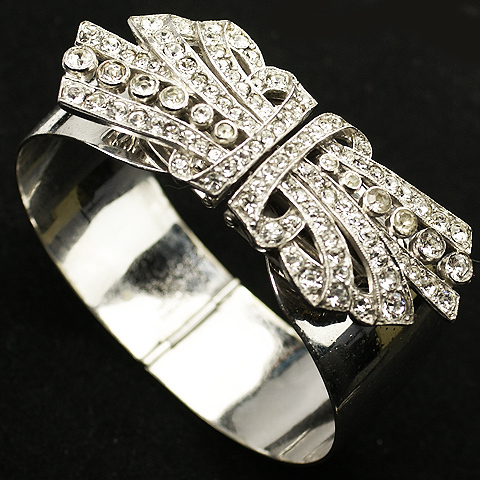 You have to love this 1930s Trifari Clip-mate bangle desinged by Alfred Philippe! The dress clips come off the bracelet, so you can wear them on your dress. Genius! 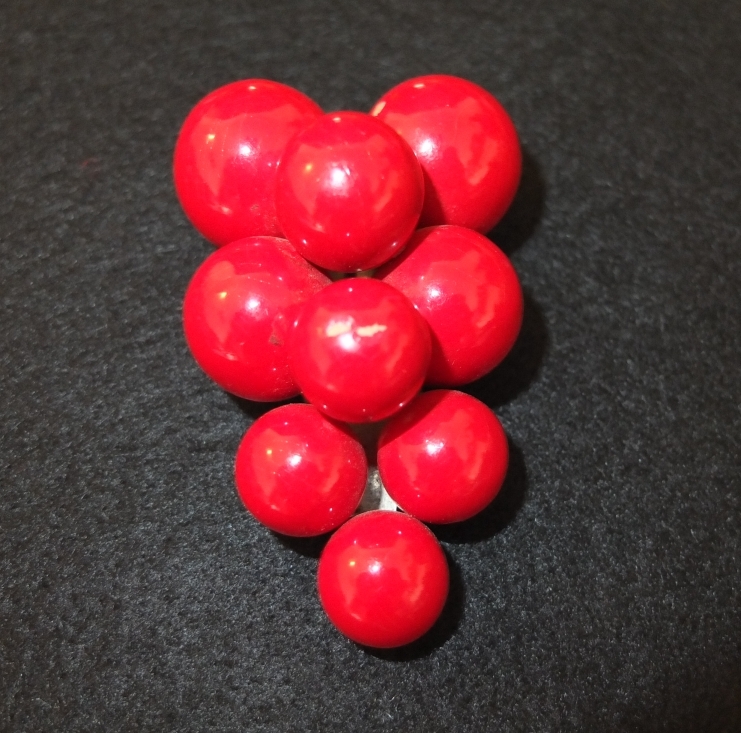 If you love dress clips as much as I do, do check out Illusion Jewels; an excellent resource. Hi hun, thanks for the comment! They really do make the LBD outstanding! ;0 I do the same thing, wear my shoe clips as dress clips and vice versa. Why not! Have a fabulous weekend! I’ve got to get up-to-date reading your blog. I agree! Dress clips always take an outfit to the next level and I’m happy to report that they are being made again. 🙂 I’m part of a team that works at Jubilee Jones, a fashion jewelry brand that is dedicated to making dress clips a staple again. Our first collection has just launched over at Jubilee Jones.com if you’d like to check it out. Love your blog! Sometimes I really do feel like you and I are on the same kind of vintage wavelength. I recently reread my late 30s copy of Designing Women in which dress clips are mentioned a number of times. As I don’t have any of these delightful accessories in my wardrobe (oodles of brooches, but no dress clips), I’ve added them to my list of “to find” items in the coming months (hopefully). Anyhooo, all that to say that this post couldn’t be more timely for me, dear gal. Thank you!!! Love-love-love dressclips. Thanks for featuring them! Still, the posts are very short for beginners. May just you please prolong them a little from subsequent time?